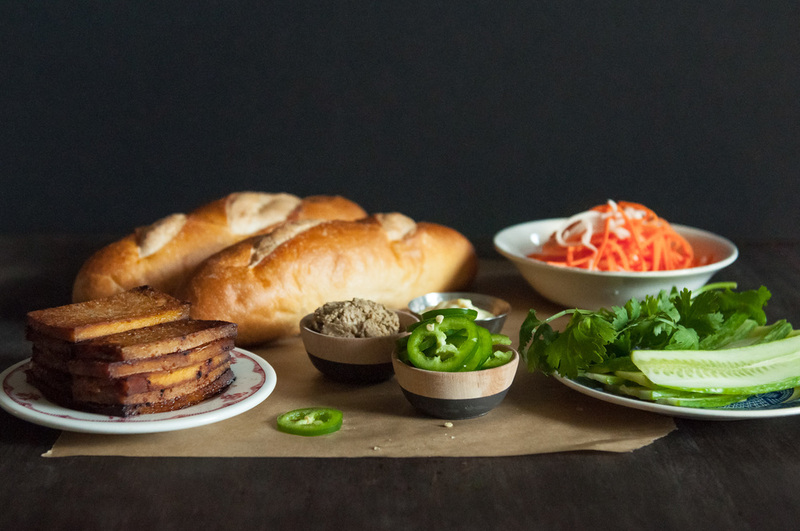 I don't claim to even remotely know what an authentic bánh mì tastes like. But I thoroughly enjoy getting them at my nearest Vietnamese bakery/cafe/pho joint wherever I'm living at the moment, so here is my attempt to make them at home, based on bánh mìs I have eaten in Austin, Chicago, and Manhattan. 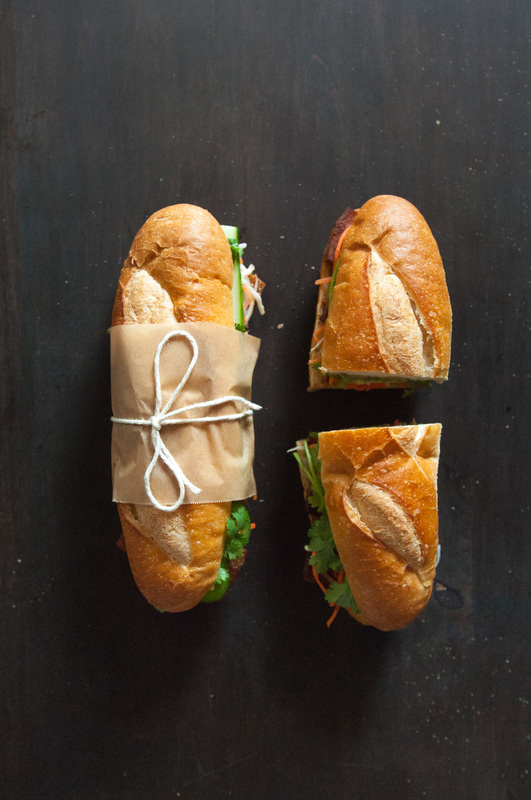 Now I usually wouldn't even attempt to re-create a sandwich that is so delicious and cheap already, and I absolutely love a classic bánh mì with ham, pork roll, pate, head cheese, and the like. But every once in a while I don't want to eat pork (pigs are so smart and cute!) and I find that the vegetarian options available are pretty sad. I've tried seitan, portobello mushroom, and others I can't remember, but I have found that the simple and often bland protein, tofu, is my favorite. I think tofu gets a bad rap. It's an amazingly versatile ingredient that can take on any flavor you want it to. 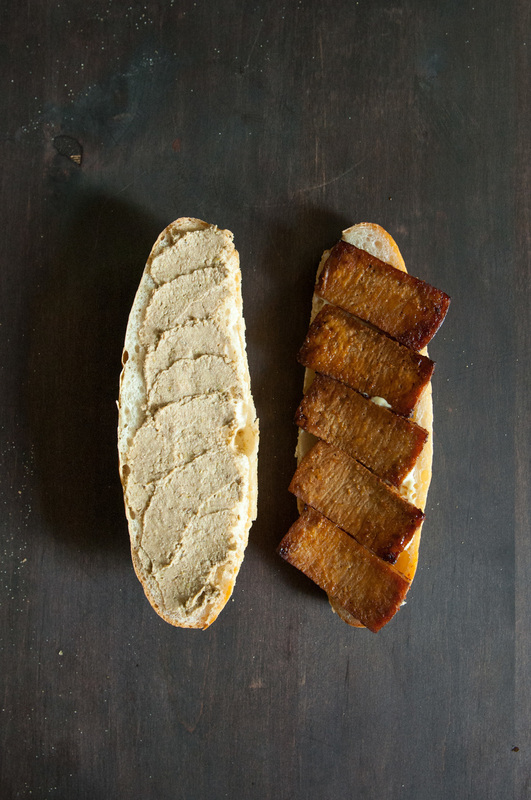 Here I make a glaze/sauce that mimics the flavors you would find on a bbq pork bánh mì. I also found some vegetarian "chopped liver" at Union Market. It was made with lentils and looked very very (did I mention VERY?) dubious, like wet concrete, but it tasted surprisingly good. 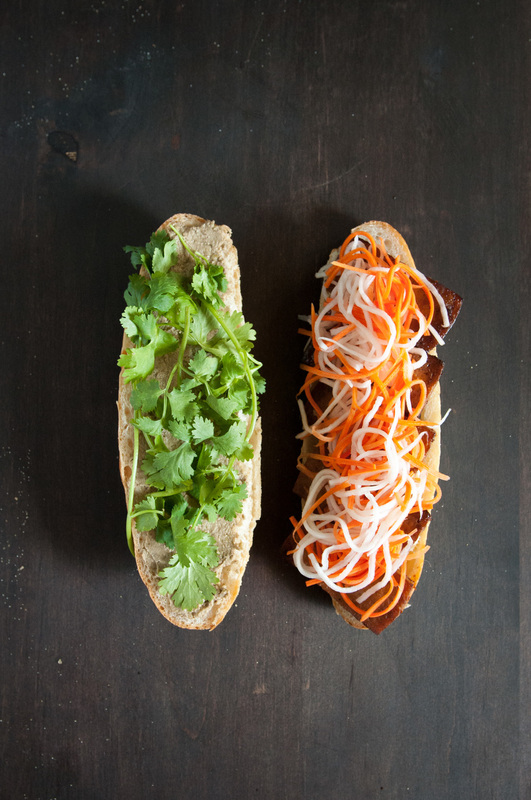 So if you're feeling dubious about a tofu bánh mì, I say try it out, maybe you'll be surprised as well. Serves 2 with pickled veggies leftover. 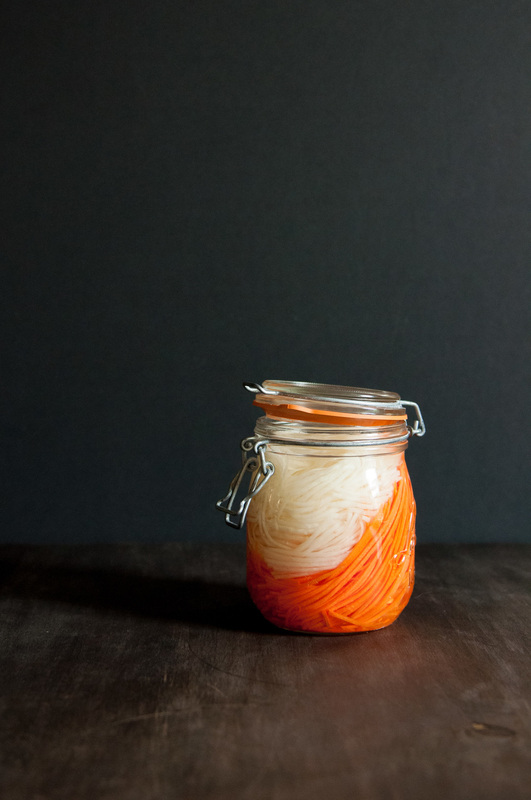 Place carrots and daikon radish in a large jar. In a saucepan, combine vinegar, water, sugar, and salt. Stir mixture over medium heat until the sugar has dissolved. Pour mixture over carrots/radishes. Seal and let cool to room temperature. Place in fridge until ready to use. Preheat oven to 400 degrees F. Place tofu on a parchment paper lined baking sheet. Combine fish sauce, brown sugar, maple syrup, soy sauce, garlic, and ginger in a food processor and blend until smooth. Brush half of the sauce over tofu and place in oven. Bake for 15 to 20 minutes. Remove from oven, flip each piece of tofu, and brush remaining sauce on top. Return to oven and bake for another 15 minutes until caramelized and tofu is dark brown in color. Let cool. To assemble, smear some pate and mayo on the baguettes, one on each side. Layer tofu, the pickled carrot/radish mixture, cucumber, jalapeño, and cilantro. Close up the baguettes and enjoy!